Going out to eat for me is usually a time to go all out — something I wouldn’t normally eat, something a little more extravagant or something less healthy than my regular routine. But every once in a while I like trying out healthy options that I just don’t know how to make on my own. And that’s exactly what I got to do when I went to Fit Fresh Cuisine with a friend last month. Fit Fresh is basically inside Hybrid Athletics in Fitchburg. They offer cleanses, meal plans and a regular menu. 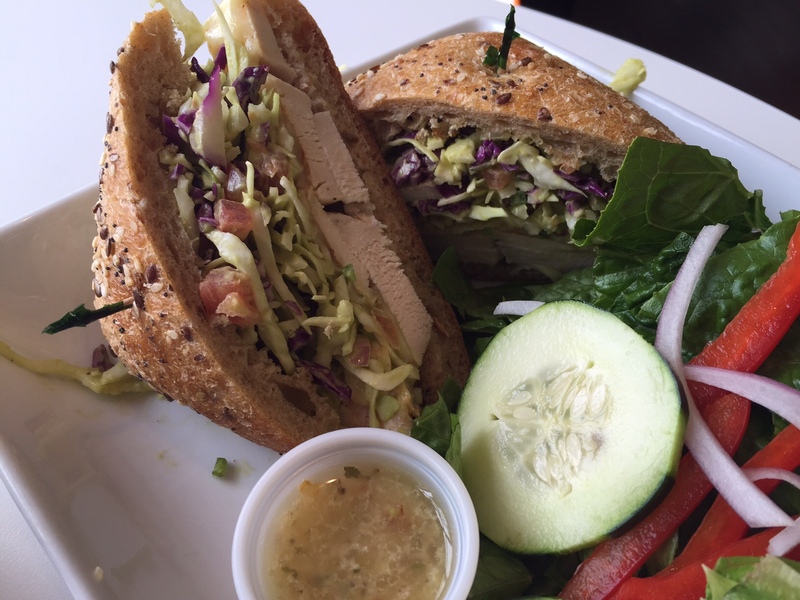 Their menu has juices, smoothies, acai bowls, breakfast sandwiches and scrambles, sandwich and salads. I’ve heard about acai bowls but never knew what they really were, so I jumped in with both feet and got the first one on the list. 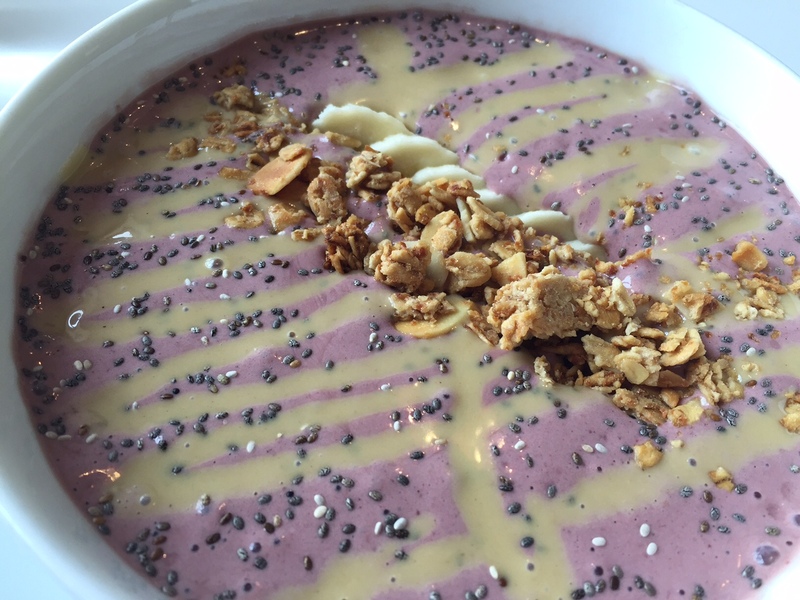 The palisade bowl comes with acai, strawberry, Sugar River vanilla yogurt, whey protein and wheat germ topped with tahini (I know…what?! ), chia seeds, pepita and homemade granola. I was expecting to get a bowl of yogurt with acai berries and a bunch of other stuff on top, but I can only describe what I got as breakfast soup. It was good, but it wasn’t what I was expecting! The yogurt-like mixture is slightly thinner than regular yogurt, but just as tasty. I was worried about the tahini on top, but it added just the right amount of savory flavor to cut the bitterness of the acai. The chia seeds, pepita and granola were the perfect crunchy additions. My bowl also had slices of banana in the yogurt. Even though it was not what I was expecting, I really enjoyed it. My friend got a sandwich and enjoyed it too. 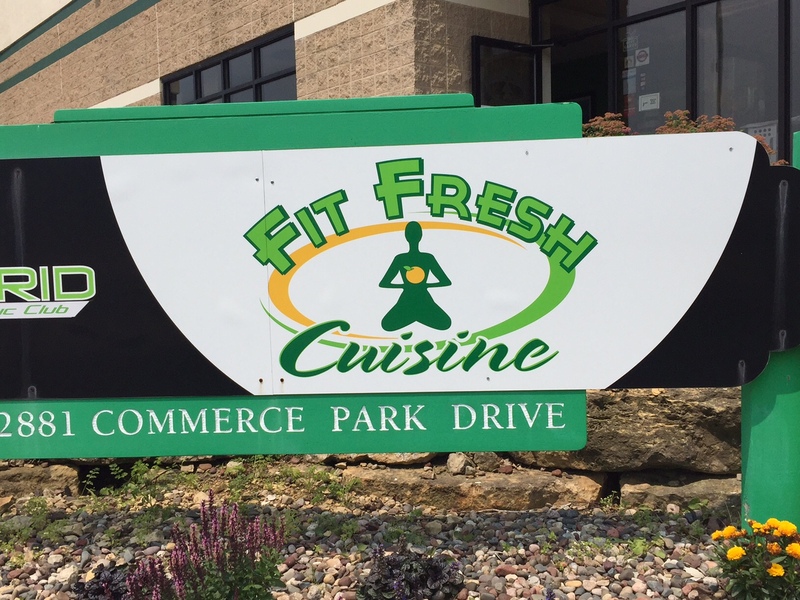 FOOD NOTES: Fit Fresh Cuisine is not very conveniently located, but if you’re in the Fitchburg area looking for a healthy lunch option you should check this place out. My acai bowl was not what I was expecting, but it was pretty tasty. I loved that it was tasty, fresh and filling. Most of the time you get one or two of those…not all three! I’ve had friends try their meal plans and cleanses, and they’ve given it some pretty positive reviews.